New Year eve's gift for film industry is the new thrill. Ho Mann Jahan has made a lot of hype through their BTS on social media. So as Mahira Khan proved her to be a good actress both on small and silver screens. Recently the Coke’s latest video featuring the lead cast of Ho Mann Jahan is going viral, and that is for good reason. Revival of Pakistani Cinema is under way, and the video — featuring Mahira Khan, Adeel Husain and Sherheryar Munawar — was released following the launch of the film’s trailer earlier this week and it shows the trio having a lot of fun. You would enjoy the video as well and might get jealous of them having fun. At the trailer launch event, Director Asim Raza had said Ho Mann Jahan is a movie about the youth. And Coke captures the same essence. And one thing i must say made my nostalgic whenever watch that TVC, the background track, which is a tribute to Zohaib and Nazia Hassan (Late). You might cherish the real friendship and this classic song in the new TVC. “Yes, it’s a film for the youth, but anyone who is connected to ‘youth’, it’s also their story,” Ho Mann Jahan director Asim Raza said on trailer launch. The two-and-a-half-minute clip shows the bitter-sweet side of life; from the fun-filled days in college to the harsh realities of real life. It gives a glimpse into the relationship dynamics the trio share and the struggle to break free from stereotypes associated with a music career. 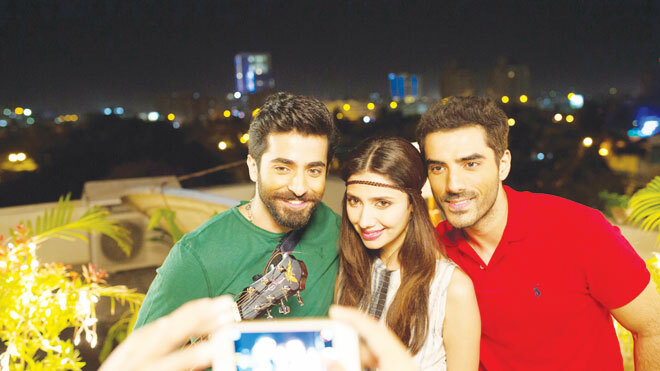 “Both actors [Adeel and Sheheryar] are very different, from different schools of thoughts. I would have to tune myself when working with each — with Adeel I’d have to be serious, with Sheheryar it was the complete opposite,” said Mahira when asked which of her two male co-stars she enjoyed working with more. The makers of the film also shared BTS footage at the event which led to a rather pleasant revelation: the handsome Fawad Khan will be seen in a cameo in Ho Mann Jahan. Asim Raza’s debut venture is definitely one to look out for, the trailer is promising and keeps the viewer hooked. The cast includes veteran actors such as Bushra Ansari, Sonya Jehan, Nimra Bucha and Arshad Mehmud. Atif Aslam, Tina Sani, Abu Mohammad, Asrar, Faakhir, Jimmy Khan, Zeb and Haniya have lent vocals for the songs in the film. The film is slated to release 1st January 2016 and many are expecting it to be the New Year’s gift for Pakistan’s film industry. Mahira is also co-starring in Btown movie with King Khan, and here she is proving to be the Queen Khan of Lolly-wood industry.